Online presence for every business is important. Businesses that made money in four figures are now generating 6+ figure revenues via online promotions. The online world allows business and individuals to reach millions in a short period that is not possible in the real world. Being online will not help your business in lead generation or reaching millions. You need to follow smart techniques for success. An online business needs a website. A website is the online address of a business with information about services, products and contact details. A website’s or online business success depends on the content provided. If the content is excellent then customer’s will understand the services and products more easily. Always focus on great content with high-quality and simple language. The use of visual content in the form of graphics, animation and videos will attract customers to the website and help in lead generation(sales). Never forget to provide complete details about your business on the website. social presence: – Every business and individual must use all the resources offered by social media websites like Facebook.com, google+, twitter etc. These websites are just not a social media website for chatting and surfing, they are the kingmaker for every business. Social media website is a platform that will help you to reach maximum audience relevant for your business in shortest time period. Create social media profiles and pages with the company name and be active on it. Continuous posting on the page and profile will help in gaining more social media followers. You will get gain right followers relevant to your business. Affiliate marketing system: – If you are a business firm and need to increase sales and traffic on the website, then nothing is best except affiliate marketing. Ask a software developer to design an affiliate script for the website. Now, by using google Adwords and facebook ads reach the bloggers. Bloggers will soon create accounts on your website and will start promotion of the website. Soon you will experience that your website is performing well in search engine ranking and sales will also increase. You need to online affiliates some percentage of the lead generation(sales generation). Search engine optimization: -every business needs organic audience. A well-optimized website with good search engine marketing will appear in top 10 search engine results for selected keyword. For this purpose, do search engine marketing by blogging, article writing, business directory submission, sitemap submission, anchor text backlinks, web 2.0 profiles etc. It will improve search engine ranking. Off-page seo and on-page seo both are necessary. Website design: -CMS like WordPress, Joomla and drupal has changed the view of the online world. There are more than 12 million websites using content management system. Design and theme of the website must match the business niche to enhance user experience. In a study, it is found that businesses using simple and outdated design are losing sales. Mobile application: -Business must have a mobile application. 65% internet users have smartphones and 35% users access the internet from mobile phones. Businesses with no mobile application are losing their audience. Mobile applications offer content in a structured manner on small resolutions that users need to read it clearly. If you fail to offer a comfortable platform to the audience then you are losing your audience. It is very necessary to feed iPhone and android mobile application link on the main page of the website. Always embed the links in the emails during email marketing. Email marketing: -from a business point of view every resource needs to utilize properly for better results. Email marketing is a technique used to drive audience on the website again. To collect email address on a website, create pop-ups, email subscription form. Use services like Mailchimp and madmimi to send fabulous and attracting emails. Add social media profile links in the emails. Conversion percentage from email marketing is 5%-6%. Digital marketing: – Digital marketing is also a way for leads generation. Digital marketing doesn’t mean a rocket science that many people think about it. An advertising campaign with animation, graphics and videos and result tracking falls under digital marketing. Go for PPC campaign, make videos and upload them on various video sharing and social media sites like youtube, facebook, Dailymotion etc. Never forget to insert website address and other contact address in the videos. Digital marketing includes QR codes. Always use QR codes while marketing offline. Insert QR codes on digital posters, digital signage advertisements, brochures, leaflets, visiting card etc. Many visitors have no time to see the digital posters and signage but have smartphones in the pocket. If they are interested in the service and have no time to see the advertisement then they can save QR codes in the mobile and can access the website by QR code. Always use the contact information and QR codes in the banners. 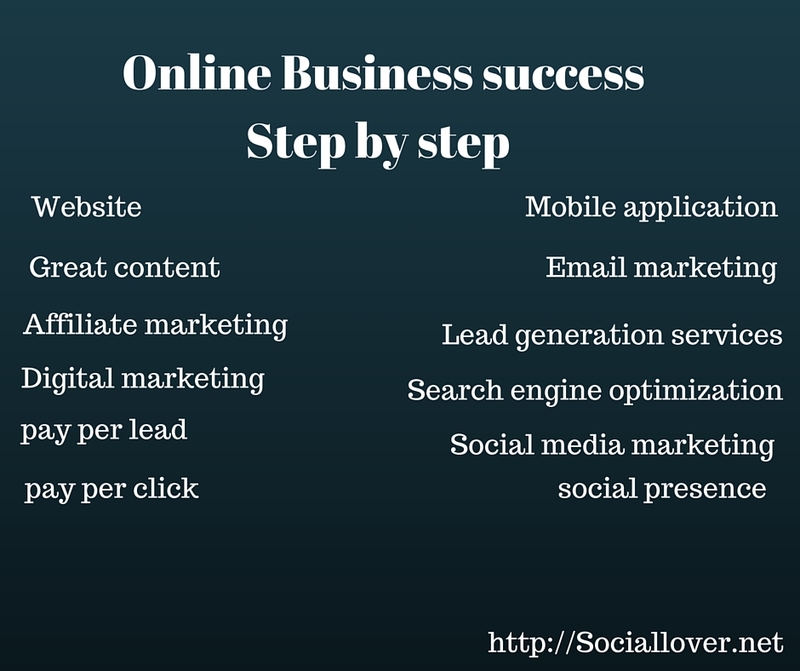 Use this information and make your online business successful. truly informative.I’m going to watch out for brussels. I’ll be grateful if you continue this in future. Loots of people will be benefited from your writing. shaed thijs fantastic paragraph at here. Hello, Please click on on-page optimazation tect, you will find a detailed information about it. This is a good help for us bloggers. I’m now more on focusing on content, and social presence.. and also upgrading my SEO coz I’m still learning on that area. I didn’t know you could make so much money online. It certainly takes time for success. This was very informative, keep up the good work! These are all key elements in getting your online business or blog off the ground and gain some attention. Great post! It’s still amazes me how we live in a world where social media has taken over!!! If you don’t have an IG, FB, TWIT, etc. etc…you don’t count! I have a feeling technology is only going to continue to develop. Kinda scary, but your have to move with the times. Thanks for this summary of essentials. Making a check list…. This is a wonderful bunch of information. affiliate marketing/lead generation website was new to me. Thank you for sharing. Interesting overview. There are a lot of ways to succeed online, and it’s literally impossible to cover them all in one article. There’s just so much depth to all these topics! I always love these tips. Who doesn’t want more traffic? There some tips I will definitely try, thanks! I have never used QR codes in my marketing, I wonder if they could be used for individual campaigns to monitor engagement. Thanks, you have given me something to think about. Out of all of those things on your list, which one would you say is the most important? Great post and very informative. I’ll definitely think about all of this during my time blogging. Thank you.